Franciscan Sister Barbara Leonhard had just earned a doctorate in Christian spirituality in the early 1990s from the prestigious Graduate Theological Union in Berkeley, Calif. A relatively comfortable life teaching in universities could have easily been hers. 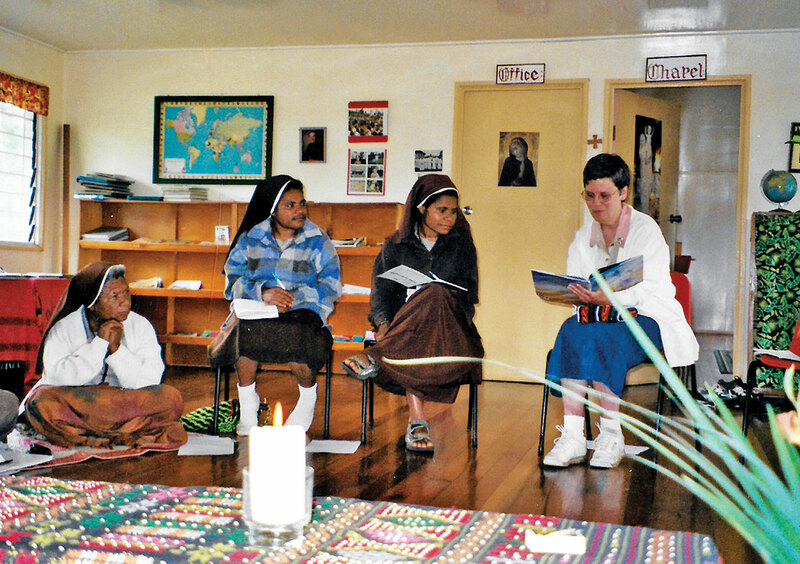 But when she was invited to travel around the world to teach Scripture to a fledgling community of Franciscan sisters in Papua New Guinea, Sister Barbara jumped at the chance. The tradition that Sister Barbara had embraced was that of the religious community she had joined in 1967, the Congregation of the Sisters of the Third Order of St. Francis in Oldenburg. 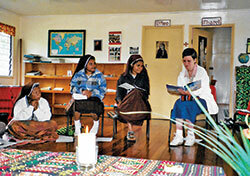 A principal guiding star of their common life is the example of St. Francis of Assisi and his first followers. Some 800 years ago, they broke new ground in religious life in the Church. Unlike the monks who came before them who were known for living within cloistered monasteries, Franciscans were on the go, traveling from town to town to preach the Gospel. So Sister Barbara embraced the chance to join missionaries from the order in the southwestern Pacific Ocean island nation. “I didn’t see doing work in an area of great isolation as making it less worthwhile or less important,” she said. In fact, Papua New Guinea soon became a classroom for Sister Barbara, helping her learn an approach to ministry that has guided her ever since. It all began with a question politely put to her by a native Franciscan sister at the end of a class session on Scripture. Unfortunately, her time in Papua New Guinea was cut short. Health problems forced Sister Barbara to return to the United States less than a year into her time as a missionary. But she has continued to follow the lead of the early Franciscans, living out of a suitcase, teaching Scripture in parish workshops and leading retreats from coast to coast and beyond. “I find myself attracted to invitations to places where I get the impression it’s difficult to find people,” she said. In traveling from place to place, the early Franciscans often reached out to people on the margins of society. Sister Barbara did this in her missionary work, but also in ministry to Native Americans in New Mexico who are lay associates of the Oldenburg Franciscans. Like her experiences in other parts of the world, Sister Barbara soon found that she benefited as much from those she was serving in New Mexico as they benefited from her. She recalled a conversation with a woman who worked as a shepherd about a Gospel passage describing Jesus as the Good Shepherd, and how he called each of his sheep by name. Closer to Oldenburg, Sister Barbara teaches in the Spiritual Direction Internship Program, a ministry of the Benedictine Sisters of Our Lady of Grace Monastery in Beech Grove. The program, which takes place at the monastery’s Benedict Inn & Retreat Center, helps participants hone skills at guiding people in growing in their relationship with God. “I think this is going to become even more of a need as parishes keep growing in size,” Sister Barbara said. “There’s such a need to have time to sit down with people and help them explore their questions and spiritual growth. Priests can’t possibly do all that as parishes get bigger and bigger. Living in Franklin County close to her community’s motherhouse in Oldenburg also allows Sister Barbara to learn from her fellow sisters. But she knows that discerning today is different than it was when she entered the Oldenburg Franciscans 50 years ago with 22 other young women. As Sister Barbara’s experience over the past 50 years has shown, having the courage to respond to God’s call can send a person around the world to share the Gospel and to be drawn closer to God by those a person is called to serve.